In 390 BC a Gallic army marched on Rome. A confident Roman army of about 15,000 men sent to bar the way was destroyed. Three days after the battle the Gauls entered Rome, much of which they burnt, and demanded a huge bounty of gold to leave the city. During the weighing procedure, Brennus, the Gallic leader, is said to have thrown his sword on to the scales with the words 'Vae victis' - 'Woe to the defeated'. A sentiment the Gauls were soon to experience first hand. 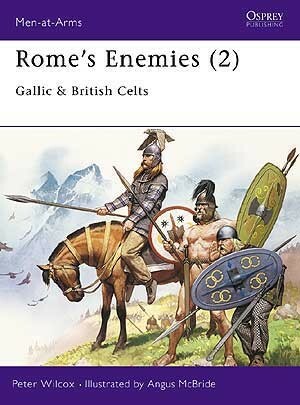 This fascinating work by Peter Wilcox explores the history, dress and equipment of Rome's Celtic enemies. Peter Wilcox is an expert on Ancient civilisations. He has written numerous articles on the subject, and has authored a number of Osprey Ancient Warfare titles, including all five of the Rome's Enemies mini-series. Angus McBride is one of the world's most respected historical illustrators, and has contributed to more than 70 Osprey titles in the past three decades. Born in 1931 of Highland parents but orphaned as a child, he was educated at Canterbury Cathedral Choir School. He worked in advertising agencies from 1947, and after national service, emigrated to South Africa. He now lives and works in Cape Town.